The interest in Hermes is not limited to its history or hazard. 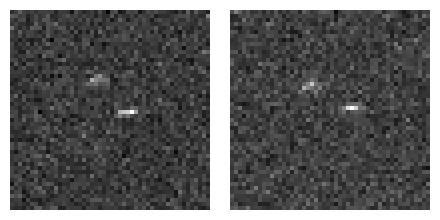 In 2002 we observed an asteroid, 2002 SY50, that bears a striking resemblance to Hermes in terms of size and orbital parameters, and it is possible that the two objects are dynamically related. 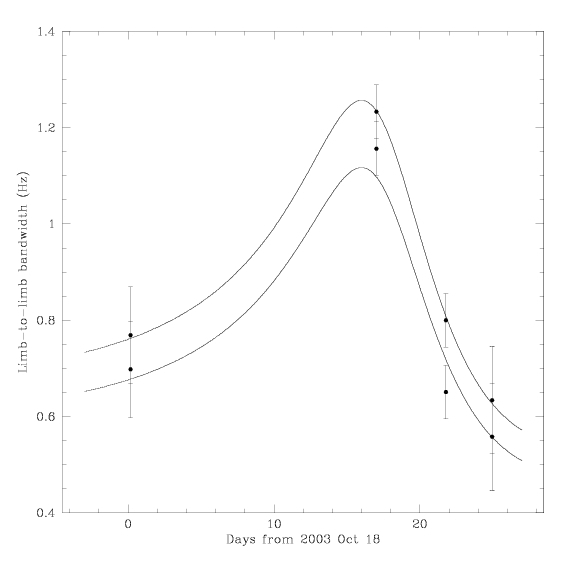 A close planetary encounter might have tidally disrupted a large object, leaving Hermes and 2002 SY50 on similar orbits. An urgent proposal was submitted to Arecibo Observatory on Oct 15 (project R1898), and time was allocated on Oct 17, 19, and 20. Additional observations are planned on Oct 25-26 thanks to the generosity of the aeronomy group at Arecibo. Time has also been requested at Goldstone, and we will observe Hermes on Nov 4, 8, 9, 11, 12. A Doppler spectrum of the radar echo obtained on Oct 17 shows two clearly separated components. The set of radar images below show the relative motion of the components over the course of about one hour on Oct 19. Motion is counter-clockwise. 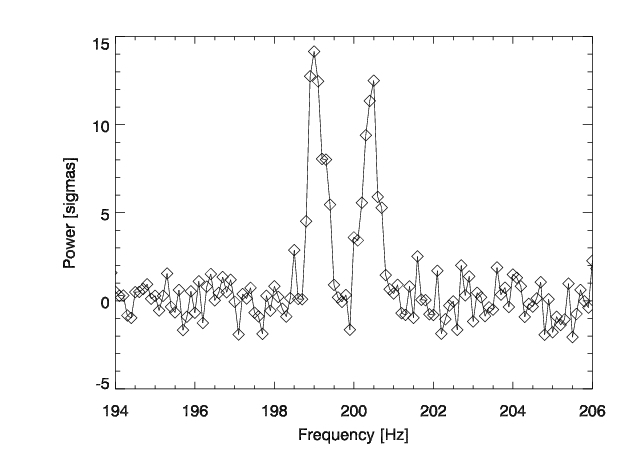 In each panel, the component at positive Doppler frequencies (right), moves toward the observer, while the component at negative Doppler frequencies (left), moves away from the observer. Radar illumination is from the top. The range resolution is 75 m.
Measurements of the range and Doppler positions of the primary and secondary allows us to solve for the orbit of the binary system. The semi-major axis is about 1.2 km, or about 4 times the radius of the primary and secondary components. The orbital period is 13.9 hours, which corresponds exactly to the spin period of both components, i.e. the system is fully tidally despun to a so-called doubly synchronous state (like the trans-Neptunian object Pluto-Charon).